Many of us spend countless hours in a chair, not just at work in the office, but even at a desk when we get home. And often we take it for granted. But having a chair that is well suited to you is vastly important. If you’ve never given your chair a second thought, we implore you to read on, find out a bit more about ergonomic chairs, and then view our reviews of the top 5 ergonomic chairs available. Although first used in 1857, and popularized amongst scientists in the 1950s, it was only in the 1970s that the term ergonomics really became part of the average person’s lexicon. When we talk about physical ergonomics, we’re referring to how items interact with our bodies. This has specific application in the medical field where regular use of items with a poor ergonomic design can affect us in imperceptible ways, yet can cause issues, specifically in people with disorders such as arthritis or carpal tunnel syndrome. Long term it can also be linked to chronic pain conditions as well as pressure related disorders. While physical ergonomics is often related to repetitive acts, such as those performed by operators on a production line, lifting and placing the same loads again and again, it also has its place in the office, where a fixed position may be assumed for a prolonged period of time. Because everybody’s physiology is very different, a single product cannot be made so that it immediately suits everybody. To deal with this most products try to build in as much customization as possible, allowing you to make multiple adjustments to the item so that it can fit your body. In chairs, normal adjustments relate to the seat, the location of armrest, and how back and lumbar support is implemented. Mechanisms – referring to how you adjust the seat, do they have pneumatic adjustment, or does it require manual cranking. Materials – chairs come in a variety of materials, from leathers and cloth to breathable meshes. One of the most reasonably priced options, AmazonBasics are known for the good quality everyday products. Amazon identify products that they feel are daily necessities and then design their own version which is often a benchmark for an adequate product. They certainly have their competitors, but cheaper options are usually by far the inferior, and higher quality products kick the price up by a long way. 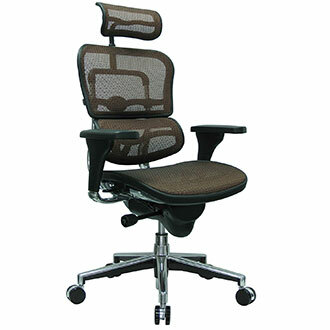 This high-back executive chair takes a standard approach to office chair design, with a typical 5-star, wheeled base approach connected to the seat by a pneumatically height adjustable mechanism, which permits complete rotation. The seat has a footprint of 29×26 inches and a height of 42 inches, adjustable to an extent that it can be 3 inches taller. The design supports a maximum weight of 250 pounds. The entire seat provides support in the form of comfortable padding which is all upholstered in bonded black leather. The rest of the chair is finished in PVC. Padded armrests are a permanent feature, adding to the structure of the chair. Everything is finished in black, besides the armchair supports and base of the chair which are silver with black accents. The chair is designed to look professional and provide all day support and comfort. The high back feature is aimed to keep your body properly aligned, important for when you’re sitting for extended times. To adjust the height of the chair you simply pull on the lever under your seat, this unlocks the seat position. If you’re seated while unlocked the seat will sink, if you release the weight the seat will rise. The lever can also be used to allow or prevent the tilting of the seat. The tilting of the seat can further be adjusted by tightening or loosening a tilt-tension knob, this results in tilting requiring more or less force. AmazonBasics give you what you expect. At a relatively low cost you are provided with a fairly sturdy product and a 1-year warranty. The product comes disassembled, but assembly is easy and the tools are provided. If you’re unable to afford a more expensive chair, the AmazonBasics does well for its price, and generally receives good customer feedback. Space Seating have put a lot of effort into ensuring that you can customize the shape of their Professional AirGrid chair so that it fits your body. The better it fits your body the less likely you are to become fatigued or too uncomfortable, ensuring you are able to perform at your best, even after hours of staying seated. This Executive chair is Space Seating’s premium chair, offering a variety of other products for different uses. The Executive is supported by 5 caster wheels on a typical star frame, with angled legs. It centers onto a pneumatic lift mechanism for height control. The seat is extensively padded and finished in black eco leather. The seat’s backrest has a cushioned outer frame, with a breathable wire mesh comprising the expanse. A headrest is also provided, finished in a neat, dark material. Individually adjustable armrests are provided, topped with soft PU pads. The pneumatic height adjustment for the seat has a range of just over 4 inches and can support weights up to 250 pounds. The lift mechanism functions in much the same way as the AmazonBasics’ executive chair, with a simple handle providing both height and tilt adjustment facilities. Tilt can further be controlled by a twist-tension adjuster. Further customization comes from the adjustable nature of the headrest, which you can position exactly as you require it. In much the same manner, the armrests are adjustable to set positions. Both of these are easily adjusted, but require you to get off the chair. A final bit of support is provided by an additional lumbar support module which attaches behind the backrest. This can be positioned at different heights to ensure that you get the most support out of your chair. Space Seating offer a good product in the form of their AirGrid Executive chair. It offers enough adjustability and additional features on top of the AmazonBasics to warrant its extra price, and if it’s within the budget, you will not be disappointed with its performance. If you’re looking for an amazing representation of style and comfort, the Eurotech Ergohuman Mesh Chair is certainly a good starting point. Coming in a variety of tinged colors, there’ll be one to fit your workplace environment. The base comprises a stylish chrome plastic assembly, with five black nylon casters providing the maneuverability you desire. Resting on top is a typical pneumatic adjustable lift mechanism, and then things start to get interesting. The EuroTech Ergohuman Mesh chairs feature eight ergonomic adjustments. Beyond your standard seat height adjustment, you are also provided with a seat depth adjustment option. Further investigation shows tilt tension control and lock, a back angle, back height and synchro tilt adjustment. All of this is thanks to the specially designed seat mechanism, coupled with a split backrest architecture, providing support in the right areas. This is then rounded off with a set of adjustable armrests and a headrest. All the surfaces are finished off with a mesh material to prevent sweating and support extended use. The seat measures 19 inches long by 18 inches wide, and adjusts from 18 inches to 23 inches above ground. It is all packaged together in a seat that weighs 66 pounds, a rather hefty amount, but adds to its sturdiness. With mostly positive reviews from customers, it is not free from criticism, and some customers felt the product did not warrant the steep price. In case all of that isn’t enough to convince you, the chair is made of 97% recyclable components and comes Greenguard indoor air quality certified. Overall the chair offers premium amounts of comfort and adjustability, but is provided at a cost, more than double the price of a Space Seating equivalent. Perhaps not something you’d purchase for a home office, but in a corporate environment where such prices are attainable, it can be well worth it, as every minute spent in the chair is an additional minute where you are seated in comfort, and not worrying about your back getting sore. At first glance you can tell that this chair means business. And that’s what Herman Miller are counting on. This is not a cheap chair. It is the most expensive chair on this list, more than double the next cheapest product. But that money is put straight towards ensuring the highest quality product is provided. In fact, Herman Miller guarantee this chair for 12 years, even allowing for 3-shift use. To avoid complications the chair even ships fully assembled. The chair is specifically designed for people that sit for more than 4 hours a day, particularly in large stints. The goal is to enhance health and improve your focus. Whereas other chairs have a backrest, the Herman Miller Embody chair’s backrest is constructed from a dynamic matrix of pixels. These pixels respond to the body’s movements, and a polyester textile lining prevents heat buildup. Many other chairs have a single board backrest, but the Herman Miller products are designed so that they can be fine-tuned to align with an individual’s unique natural spine curve, that provides not only lumbar but sacral support as well. As expected with a chair of this price, one is also able to adjust the seat depth, and a tilt limiter is included. The base and frame are made out of strong and lightweight graphite, with specialist carpet caster wheels. Fully adjustable armrests are installed, cushioned with black arm pads. The chair comes in sixteen different unique colors from your standard office blacks and greys through to blue, green and yellow. The top chair on our list today, if you can afford it, the Herman Miller was designed with input from over 30 physicians and other doctors to help solve health problems associated with sitting. Along with support, comes balance, ensuring that even as you tilt you never feel unsure or uncomfortable with what the chair is doing. Although the chair is well regarded by most, it doesn’t quite hit the high customer feedback ratings one would expect from such a chair. We’re confident that if you removed price from the equation the ratings would shoot up, but at this price, people expect miracles, which, as good as this chair is, it can’t deliver. When seeing the BestOffice Ergonomic chair, your first thought will probably be plush. Not much is provided in the way of customizability, but the company put a lot of effort into their padding. The seat comprises a rigid backrest and seat, held in place by sturdy, fixed armrests. This is suspended on top of a conventional pneumatic lift mechanism, standing on a five spoke, caster wheel base. The seat measures 20 inches square, the height of which can be adjusted from 19 to 23 inches. The backrest is larger at 20 inches wide and 29 inches high. Overall it can support a weight of 250 pounds, weighing in at 68 pounds itself. The chair arrives in several pieces, but comes together fairly easily with the provided tools. The biggest thing running for this chair is its price. It is the cheapest product on the list, and competes with the AmazonBasic on a quality basis, although some customer’s feel it is not as sturdy as they would have liked. Otherwise the seat and backrest are covered in cushions with a fair amount of play, contouring to your body and finished with a black leather. The armrests are finished in a similar manner. With the BestOffice Ergonomic High Back chair you get what you pay for. You may not want to stay seated the entire day, but the chair will do well for several hours a day, potentially requiring replacement every four to five years. We hope that you now have a better understanding for ergonomic chairs, and how important they can be, not only for your day to day life, but for your continued health. We’re sure that after considering all the factors, you’ll agree that such an item is a necessity for all, and that our list of the top 5 ergonomic chairs provides a suitable solution for your requirements.